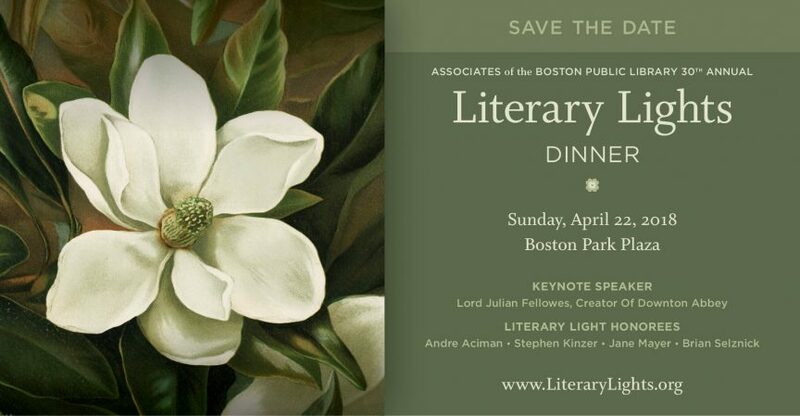 The Associates of the Boston Public Library is delighted to host the 30th annual Literary Lights dinner—a black tie gala that celebrates outstanding writers, illustrators, and intellectual luminaries. This year’s four distinguished honorees, or “Literary Lights,” are being recognized for their excellence in a wide variety of genres. Collectively, they have won numerous prestigious awards for their achievements. Nearly 500 guests are expected to attend the dinner, which will take place on Sunday, April 22nd, 2018, in the Grand Ballroom at the Boston Park Plaza Hotel. The awards will be presented by their peers, respectively: Stacy Schiff, Gregory Maguire, H.D.S Greenway, and Alice Hoffman. The presentation of these prominent authors’ awards will be followed by featured speaker, award-winning writer, director, producer and actor Julian Fellowes. As creator, sole writer and executive producer of the hit television series Downton Abbey, Fellowes has won three Emmy awards and a Golden Globe. Fellowes received the Academy Award for Best Original Screenplay for Gosford Park (2002). His work was also honored by the Writer’s Guild of America, the New York Film Critics’ Circle and the National Society of Film Critics for Best Screenplay. Other writing credits for film include Piccadilly Jim (2004), Vanity Fair (2004), Young Victoria (2009), The Tourist (2010), Romeo & Juliet (2013) and the upcoming The Chaperone and for television the four-hour miniseries Titanic and Doctor Thorne. Fellowes also wrote and directed the award-winning films Separate Lies and From Time to Time. Fellowes wrote the books for the Tony-nominated stage production of Mary Poppins and for School of Rock: The Musical which opened on Broadway in December 2015, and was written and produced by Andrew Lloyd Webber. Fellowes has authored three international bestselling novels: Snobs (2005), Past Imperfect (2008), and most recently, Belgravia (2016). Educated at Ampleforth College in Yorkshire and Magdalene College, Cambridge, Fellowes was given a peerage in 2011 and entered the House of Lords as the Lord Fellowes of West Stafford. Rebecca Eaton, executive producer of MASTERPIECE on PBS, will join Fellowes on stage in conversation. Proceeds of the event will benefit the David McCullough Conservation Fund, William O. Taylor Art Preservation Fund, Associates Endowment Fund, and the Associates of the Boston Public Library’s operations. These funds provide a consistent source of funding for the restoration and preservation of the Library’s Special Collections of rare books, manuscripts, musical scores, works of art, and other items of historical significance. Literary Lights will start with a cocktail reception at 6:00 pm, followed by dinner at 7:00 on April 22nd. Tickets can be purchased online at www.LiteraryLights.org or by contacting the Associates’ office at (617) 536-3886.